Here's my 5th postcard for The Craft Barn's Quotes and Lyrics challenge where this week the words are ROAD and/or ART. Quite a lot of choices this week - Road lyrics and Art quotes - but I thought I'd use my Tim Holtz stamp with the famous Scott Adam's quote. The background is sprayed with Ink in a Bottle - Spode Blue, Jubilee Blue and Pearl Silver which makes it difficult to photo but looks very shiny in real life! I've stamped the quote with Onyx Black Versafine so it sits on the mica and just filled in the word Art with red sharpie. 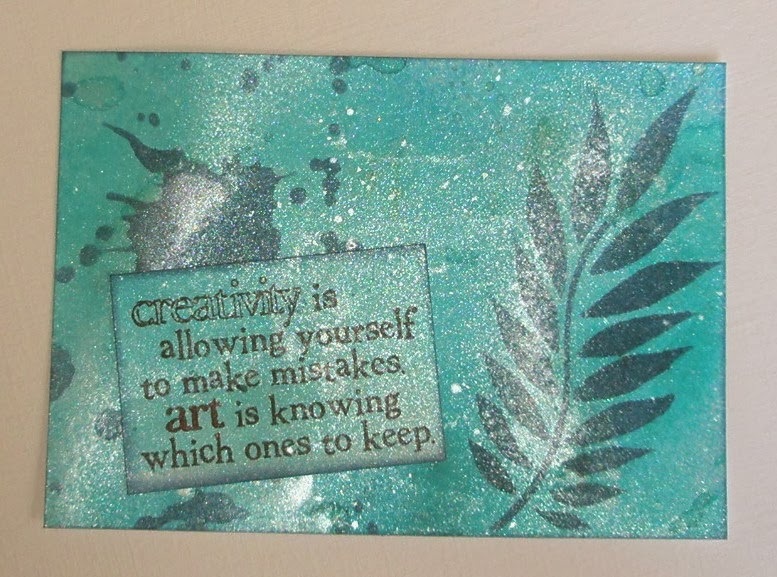 I've blended Faded Jeans Distress ink through 2 stencils - Tim Holtz's Splatter to represent mistakes and Lin Brown's Paperartsy PS002 for art to keep!! You've captured the sheen well in your pic. It's a great (& very apt) quote. Beautiful page. Love the background and the fantastic colour. Beautiful background with lots of shimmer! I think you caught the shimmery background well. I realize how hard it is to get all that beauty to show through a camera lens. I also like that quote. And for once I finally had a color (bottle) that you referenced! Great job. A fabulous quote and a gorgeous card. Love the blue. Snap we used the same quote stamp but two completely different "art" love the colours you have used. Good quote and I love the way if covers the "mistake". What a great quote!!! Love it! Beautiful shimmer! Beautiful colours, a lovely postcard and I love the quote. A great postcard. I love the colours and the shimmer. Running late with all my commenting this month but here I am. Fabulous art quote, amazing colour on you postcard.